The threat of an overnight frost drove me into the garden this evening. Frost is Nature’s way of telling the gardener and farmer that it is time to slow down. The hard work of the season has come to an end. The growing season is filled with endless tasks to assist, as best as humanly possible, the growth of bountiful crops. But Frost steps in and brings with him an abrupt end to the season. With one visitation many of our beloved warm season vegetable crop’s growth, comes to a halt. Tonight I entered the garden with the expectation of a final harvest. I meticulously moved my way from plant to plant harvesting what needed to be saved from the impending doom. I didn’t waste my time with the green beans; they had already given their last few beans last week. The cucumbers had begun to fade a few weeks ago, but there were still a dozen lemon cukes that I’ve been planning on turing into pickles. 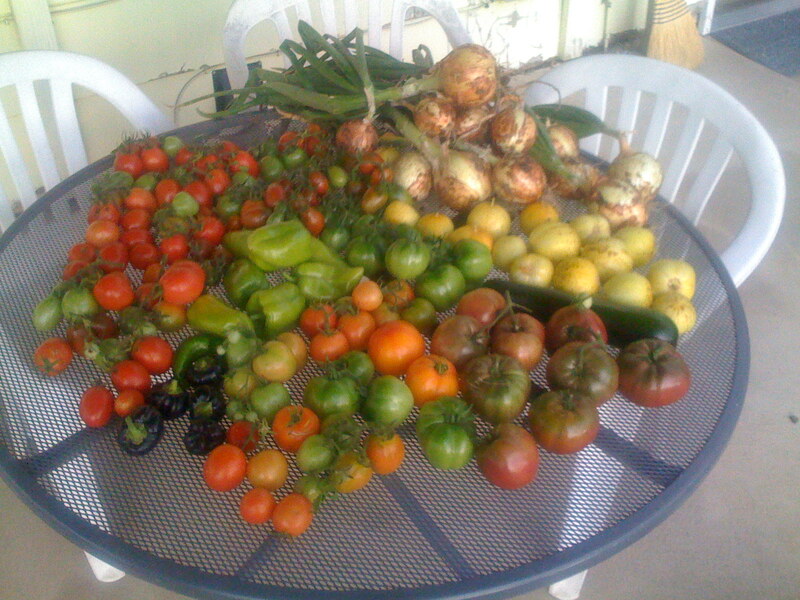 I grabbed the dozen I wanted and left three times that many on the vine. Those left were either overripe or damage and will meet their end in the compost pile a week from now. Next came the harvest of onions. I stooped down to the hard soil (you should stop watering your onions a week or so before you harvest) and dug each onion out by hand. The onions ended up with quite the range of sizes, from tiny, shallot sizes to huge, softball sizes. I think of everything grown this year, onions seem to pique my interest the most. Tomatoes and cucumbers-those are what normal people grow in thier gardens. Onions, however, seemed to be outside of the norm for the average backyard grower. It’s been amazing to see them go through their growth phases. After I finished harvesting what I wanted I stood back and looked at what was left of the garden that I spent the summer toiling in. My heart was filled with a great sense of accomplishment that I hadn’t felt in quite some time. I had crafted this garden plot into an investment of time, resources and emotion, and had harvested ten fold what I put in. I wish more people could experience this feeling. I want to help more people experience this feeling. But now, with the frost quickly approaching, my job is to inspire people to take part in this expeirence whether through digging up thier yard and planting rows of crops or simple filling a pot with some soil and a few seeds. The harvest has been abundant. this is like shannon’s dream what you got going here. michael davenport’s grandparents invited us over last night to pick grapes off their vines.we got 3 bags of grapes, both green and purple, though there are far far fewer green. and we were the last people to come over and pick ’em. pastor john’s wife was leaving as we arrived, and so was another women, and my parents were there picking with us. and my parents got even more than we did. and there was still large bountiful bunches that had grown into the neighbors yard that we couldn’t get to because the fence was in the way. they are delicious. the best grapes i’ve ever had. Wow! That’s a nice looking bunch of veggies! Makes me want to start planning for spring already! I just bought a dehydrator to preserve some of my excess harvest. I like the idea of dried fruits and vegetables that can be packed in sandwich bags more than canning them – it just seems like a more elegant solution to the food storage problem. I’ve got plans to build a large dehydrator that can handle a lot more food at once, and I think I’m going to pretty much turn half of my back yard into a garden.